His Excellency the Ambassador of Serbia in the People’s Republic of China PhD Milan Bacevic visited the Military Intelligence Agency on 25 August in order to discuss and coordinate all activities necessary for the organization of the visit of the President of the Republic of Serbia Tomislav Nikolic to China and participation of the Serbia Armed Forces’ contingent in the military parade in Beijing. The Deputy Director of the Military Intelligence Agency Colonel Zoran Stojkovic expressed his content with the visit of the ambassador as well as the expectation that this will become a tradition in future. 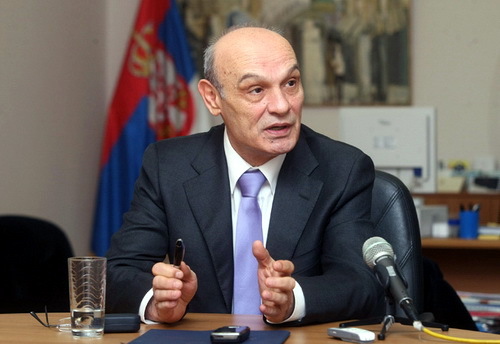 Ambassador Bacevic and Colonel Stojkovic have agreed that the relations between the Republic of Serbia and the People’s Republic of China and the relations among their armed forces are traditionally very good and concluded that they should be further developed, given that the People’s Republic of China is one of the four pillars of the foreign policy of the Republic of Serbia. 75 members of the Guard of the Serbian Armed Forces attended the military parade marking the 70th anniversary of the end of the World War Two. The military parade was also attended by the six-member delegation of the Ministry of Defence which was led by the Chief-of –Staff of the Serbian Armed Forces General Ljubisa Dikovic.